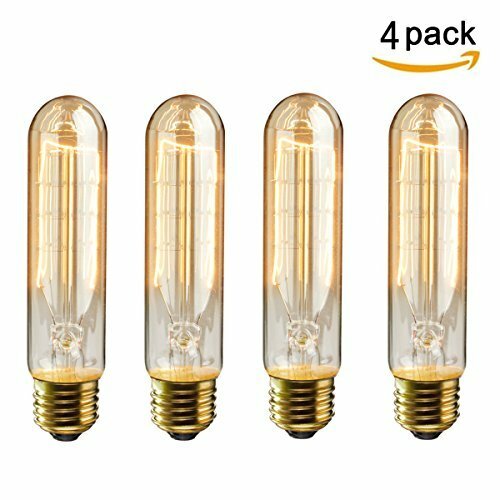 Classic shapes made with hand-woven thread filament and glass.Each 60W bulb fits a standard light socket,making it an easy,?fun alternative to any basic light bulb,maintaining a life span of up to 3000 hours. Nowadays,Edison antique bulb widely used in bars,hotels,karaoke. Pre-purchase Notice: The vintage edison tubular bulbs are incandescent bulbs, not LED lights. They produce a lot of heat. Precisely crafted, antique-style filaments give off a warm amber light that would make Thomas Edison feel at home. The T10 Edison bulbs have an E26 / E27 (Medium) base which means they fit standard home lighting sockets as well as any pendant light fixtures.